STEM is an acronym associated with a style of teaching in which science, technology, engineering, and mathematics are taught synergistically. In the past, these subjects were only taught separately. Nowadays STEM learning integrates each of these subjects into an amalgamated system with real life experience and applications. Recently, the number of students interested in STEM careers has started a downward trend in sheer workforce numbers. With technological advancement always on the uphill slope, however, it is believed by many that STEM-related career numbers will follow this upward trend. STEM education and careers are the basis of modern advancement. The goal of STEM-focused field trips is to take the nation’s youth from the middle of the pack, to international forerunners in technological innovation by providing them a more useful and relevant experience in each incorporated field from an early age. Where better to learn about the world than the great outdoors during a STEM field trip in South Florida? As we mentioned earlier, STEM is associated with science, technology, engineering, and mathematics. In STEM education, these subjects are taught in harmony as opposed to being taught as separate constructs. When students are taught these concepts as a whole, it can open their minds to thinking outside the box in fields that have historically demanded a generous amount of inside the box and strictly logical thinking. One very effective way to bring STEM to students is in the form of field trips with experiential learning. STEM field trips in South Florida can facilitate a golden opportunity for kids to gain firsthand experience through experiential learning in the field. What STEM-focused field trips are offered in South Florida? Coastal Connections: Venture to the edge of the Gulf of Mexico and explore a barrier island. Students will uncover the natural wonders of mangrove systems and their diverse range of flora and fauna. They will also have the opportunity to dissect a spiny dogfish and study various marine life up close in this hands on approach to learning. Myakka Mysteries: One of the oldest and largest state parks in Florida. Students will have the opportunity to take in a stunning ecosystem while following a winding trail through a misty floodplain forest in search of natural disturbances. There is also much to be explored in the immediate vicinity of Myakka Lake such as alligators, fish, invertebrates, and a host of avian species. Organic Earth: Students will learn from an interactive tour of a working organic farm. This farm teaches students what it means to “go green.” They will have the chance to engage in an in-depth investigation of water cycles and ground water filtration as they identify the causes and impacts of acid rain, industrial agriculture, and oil spills. Water’s Journey: Visit multiple Florida habitats while studying the cycle of rainwater that provides runoff into estuaries with natural springs. Students will encounter a number of different wildlife species while kayaking and snorkeling on the Rainbow River and Myakka Lake. They will also have the chance to collect water samples and take water quality samples from different sources. Witness the dynamic estuarine environment of land and sea, as freshwater meets saltwater in the Tampa Bay estuary. 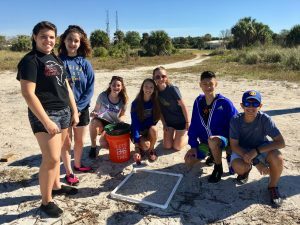 Florida – Past to Present: Students will have the opportunity to dig deep into Florida’s rich ecological history in Florida – Past to Present. Venture through an underground cave, and an organic farm to learn about the importance of agriculture in Florida. Students will also learn how water has shaped our state through the years, and be treated to a wonderful opportunity for stargazing and astral identification on this overnight field trip. For more information about our STEM-focused outdoor field trips click here or call us on 941.462.2162. One of our friendly staff will be happy to help you.